A big shout of appreciation goes out to Darren and Helen Currie for making this happen; with only twenty fours hours notice at their disposal, a good turnout welcomed Chris Haueter to the gym in Pontefract, where Chris took the no gi class. 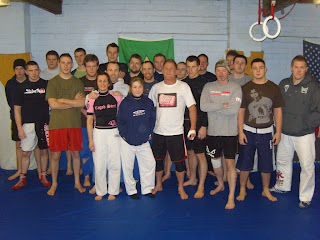 Chris has recently been touring South Africa, giving a number of seminars out there and on his return to LA, Chris has stopped by in the UK, to travel up to Scotland, where he is cornering one of his students in an MMA fight. Prior to the MMA fight, Darren and Helen were lucky to get Chris to stay over in Pontefract for 48 hours and as a result, it was another road trip to the historic market town for the Fighting Photographer. Chris started the class with a quick warm up and went in to show the class the way to execute a proper sprawl and after showing a number of takedowns from the clinch, Chris took the class through a number of sweeps and submissions from the sprawl position for the man on top and also for the man on the bottom, who, after the sprawl, had managed to secure one leg. From there, Chris showed the class a few techniques from the guard position, including the two on one hand position, applicable for MMA and from this position, introduced the ‘Russian’, a very deceptive little hand and arm tie up, that can lead into turn overs and submissions galore. Sadly, time was against Chris to show us everything from this position and the class finished off with rolling from the sprawl position; from this position Chris warmed himself up on Darren before moving on to my good self and after a walk in the park (for Chris! ), he returned to finish off Darren, before moving back and doing the same to me! Chris will be back in the UK around July, where he will be here for around two weeks, taking classes and running seminars at various Combat Base clubs, so expect to see more reports and pictures in the summer! Four weeks have passed in what seems like a blur for the Fighting Photographer, having the arduous task of travelling the country in a bid to provide you dear reader, with news and stories from the UK’s top jiu jitsu and mixed martial arts instructors, together with blow by blow accounts on the hottest MMA events blasting their way onto the circuit – it’s a tough job I keep telling myself! 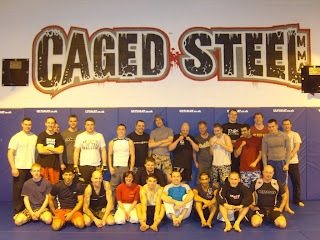 Once again on March 4th, I found myself heading over the hills and entering the land of the White Rose, that of Yorkshire and more specifically, the town of Dewsbury, where, tucked away on an industrial estate, away from prying eyes, lies the MMA academy Caged Steel. From this state of the art MMA academy, Darren and Helen Currie take a regular monthly session for the students at the gym and deliver jiu jitsu based sessions tailor made for the no gi and MMA practitioners and competitors that train there. Moving on from the session last month, finishing from the back, Darren and Helen centred around finishing the opponent after sprawling against a double leg attack, where the opponent is on all fours, or the turtle position. After the obligatory warm up Darren introduced a number of ways of stopping your opponent’s attempted double leg attack by way of a number of under hooks and body locks; rather than start each double leg attack from standing and saving wear and tear on knee joints and noses and cheek bones, the students began their attacks from the kneeling position, which had the desired effect with many students quickly gaining confidence on the shoot in. Satisfied everyone was au fait with blocking the leg attacks, Darren went through a number of finishes from various positions, including the chin strap from double underhooks, Anaconda and Brabo chokes from over under positions and crucifixes and basic wrestling turnovers from side ride position. Teaching finished for another month, all that remained was a few rounds of rolling and another monthly session was brought to a satisfying conclusion; the next four weeks will, once again, I’m sure pass by in a whirl and I’ll be back on my laptop with news from the next seminar. Until then, keep training and see you on the mats!